Most civil engineering companies rent vibration monitoring kit when the job requires it. The person assigned to carry out monitoring may never have seen the kit before and reading through a user manual is the last thing they need. The Accudata GVM-10 is supplied in a good quality carrying case with all accessories, a calibration certificate and a one page user guide. Should it be needed, there is a full manual on the memory stick provided. The GVM-10 has a single range measuring Peak Particle Velocity (PPV) between 0.03mm/s and 200mm/s with a frequency range of 2Hz to 250Hz. After siting the tri-axial geophone sensor, switch on and start recording. The GVM-10 shows levels with their frequencies in each axis on the display, updating every 2 seconds and data stored on an SD card. 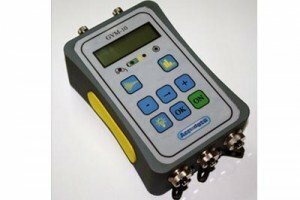 Battery life is 50 hours or the GVM-10 may be run continuously with the charger plugged into a mains supply. Each event may be up to 24 hours duration. If the unit is left monitoring, another event will automatically begin at midnight. The SD card is able to store 1000 events. Access the data by plugging the SD card into a computer. The GVM-10 does not connect to a computer, thus totally removing connectivity problems. The supplied analysis software enables an A4 printout (a graph of PPV against time) for each event. Data may be exported for use in a spreadsheet or in pdf format for sending to third parties.